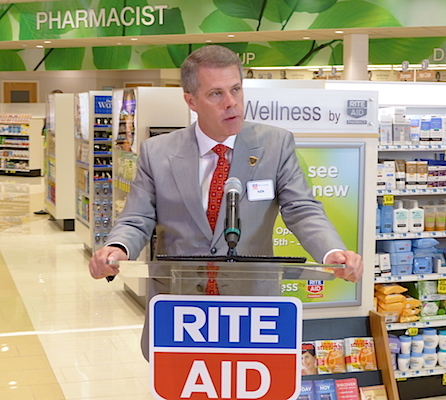 CAMP HILL, Pa. — In a reorganization of key leadership, Rite Aid Corp. has promoted president and chief operating officer Ken Martindale to the newly created position of chief executive officer of Rite Aid stores. The drug chain said late Monday that Martindale, 55, takes the new post effective immediately and will continue to report to John Standley, Rite Aid’s chairman and CEO. Martindale also will retain his role as president of Rite Aid Corp.
“Ken is a proven leader who, since joining our company in 2008, has played an instrumental role in driving Rite Aid’s improved business performance. We look forward to further leveraging Ken’s strong leadership skills and broad understanding of Rite Aid’s business to help us continue our momentum and successfully grow our business,” Standley said in a statement. “In addition to my ongoing responsibilities and duties as chairman and CEO of Rite Aid, Ken’s promotion will allow me to also focus on working closely with our new health care-focused management teams at EnvisionRx, RediClinic and Health Dialog to further accelerate our growth by implementing initiatives that deliver value to our customers and help us provide greater access to convenient, affordable and high-quality health care,” Standley added. Rite Aid also announced other executive management appointments, who will report to Martindale. Jocelyn Konrad, currently group vice president of pharmacy services, has been promoted to executive vice president of pharmacy, succeeding Robert Thompson, who plans to retire Sept. 18 after a 38-year career in pharmacy, including 11 years with Rite Aid serving in a variety of senior management positions. Tony Montini, executive vice president of merchandising, will become executive vice president of merchandising and distribution. Wilson Lester, senior vice president of supply chain, will continue to manage Rite Aid’s distribution network and will report to Montini. And David Abelman, senior vice president of brand development and innovation, will take on the newly created role of executive vice president of marketing. John Learish, senior vice president of marketing, will continue to manage Rite Aid’s retail drug store marketing team and will report to Abelman. The executive changes come as Rite Aid pushes ahead with its strategy to transform itself into a retail health care company. In June, Rite Aid completed its acquisition of EnvisionRx, a pharmacy benefit manager, which followed a pair of key acquisitions last year: RediClinic, a retail health clinic operator, and Health Dialog, a provider of health coaching, shared decision-making and health care analytics. Frank Sheehy, CEO of EnvisionRx, and Web Golinkin, CEO of RediClinic and Health Dialog, report to Standley. The drug chain also continues to bolster its store base with remodels to its Wellness Store format, which features expanded pharmacy and clinical services, a redesigned front end with enhanced merchandising, and an improved store layout. Martindale, one of the format’s architects, reported that as of the end of the fiscal 2016 first quarter, Rite Aid had a total of 1,741 Wellness Stores, about 38% of its store base.